Participate in silent retreats to renew body, mind, and soul. You may be surprised at what seclusion with God will do for your mind, body, and soul....Through the portals of silence the healing sun of wisdom and peace will shine upon you. 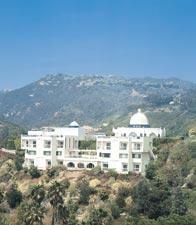 These programs are held at Self-Realization Fellowship Retreat locations (listed below). 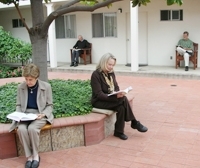 In addition, How-to-Live Retreat programs are held at various other facilities around the world. While the following general information applies to all Retreat locations, please check with individual Retreat offices since some details may vary. Three wholesome vegetarian meals are generally served daily in the retreat dining rooms. As there is generally not a choice of menu, if you have dietary restrictions, please discuss this with the retreat registrar when making your reservation. Clothing should be comfortable and informal. In keeping with the ideals of a spiritual community, we ask that retreatants dress modestly, and that they not wear shorts or similar attire inside the Retreat. Some type of footwear should be worn at all times, preferably soft-soled to help preserve the quiet atmosphere of the Retreat. At the Encinitas Retreat, on Wednesday and Sunday afternoons (depending on availability), retreatants may visit the Hermitage where Paramahansa Yogananda’s living quarters have been preserved as a shrine. Also, during conducted retreats at SRF Lake Shrine (depending upon availability), retreatants may visit the Houseboat where Paramahansa Yogananda sometimes resided during the establishment of the Lake Shrine. The costs of meals, lodging, and daily upkeep for all SRF Retreats are covered on a donation basis. The suggested donation amounts vary among the various Retreat programs. Please check with individual Retreat offices for specific details. The kind support of those who can offer more than the suggested donation of each retreat program helps us to continue to offer these spiritual services to all, regardless of ability to contribute financially. To make a reservation, please contact the retreat of your choice directly. At the Encinitas Retreat and Ashram Center, Paramahansa Yogananda lived for many years and began the first SRF retreat program. It is beautifully situated high above the Pacific Ocean, about 25 miles north of downtown San Diego. Reservations may be made from one to seven days, depending on availability. Weekends (Friday to Sunday) are usually reserved as a unit, although retreatants may check in prior to the weekend and stay into the following week. Visitors who wish to remain in the Encinitas area for periods longer than retreat accommodations allow are welcome to attend the meditations and classes at the Retreat while staying at another location. The Encinitas Retreat is closed for the weeks of Convocation (held each summer in Los Angeles) and Christmas. Reservations for the weeks before and after Convocation are usually limited to just a few days and are reserved for those coming from long distances. Reservations may be made for one to six days, depending upon availability. Check-in time is between 2:00 and 5:00 p.m., Tuesday through Friday (the 5:00 check-in on Friday allows time for a light meal before attending the evening meditation at the Lake Shrine Temple). Checkout for weekend retreats is Sunday afternoon. The retreat is closed Mondays. The Lake Shrine Retreat is closed for the weeks of Convocation (held each summer in Los Angeles) and Christmas. Reservations for the weeks before and after Convocation are usually limited to just a few days and are reserved for those coming from long distances. Conducted retreats are offered throughout the year. Please see retreat schedule for dates. The Greenfield retreat is located in the Shenandoah Valley in northern Virginia, amidst a lush deciduous forest. Three cottages are available for women to enjoy private retreats. During private retreats, women are invited to meditate with the monastics daily and may participate in service activities. For more details, please call our retreat number listed below. During general retreats (open to both men and women), no lodging or meals are provided. Please call the Retreat for a list of nearby accommodations. Additional information is available on the Greenfield website. The Bermersbach retreat is located in the Black Forest, one of Germany’s most picturesque locales, amidst mountains, meadows, streams, and forests with readily accessible foot and bike paths. 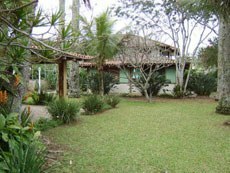 The spacious building and grounds includes a chapel, kitchen and dining room, a comfortable library/living room, and landscaped lawns and meditation areas in the gardens. Conducted retreats are offered monthly. Retreats conducted by SRF lay members are offered during the summer and winter months, as well as on special weekends throughout the year. This program includes practice of the Energization Exercises, group meditations and kirtans. 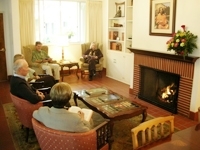 Once or twice a year, Self-Realization Fellowship monastics from the International Headquarters conduct a special retreat (see retreat schedule) which, in addition to the regular program, includes inspirational services and classes on various aspects of the Self-Realization Fellowship teachings. Individual retreats are available year-round. The chapel is open for individual meditation, and attendees prepare their own meals for this program. The facility fronts the Atlantic Ocean, and offers guests beach access, peaceful meditation gardens, and expansive ocean vistas.